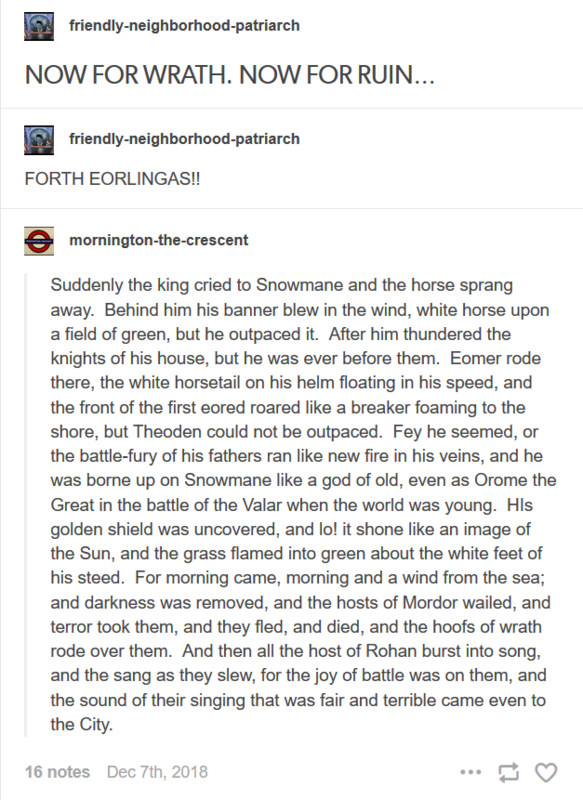 The ride of the Rohirrim - B. Farrar, Ltd. This is the sort of thing that makes--made?--Tumblr as a platform. You used to get this sort of thing in the LJ comment threads, but it doesn't seem to happen much anymore, at least not in the comms I'm part of--we had a taste of it still over at spn_bunker, before that finally closed up shop (alas). ...Anybody have any active hang-out comms to recommend? The only ones still going on my friends list are purely fic announcement boards. Or is there some way I could set up things here to better encourage chatting? I'm feeling the real need to foster social bonds somehow. What's your username over there? I'm not very active at the moment, but I'm doing my best to track down everyone I'm currently following on Tumblr.